3 years & up. It's a programming language you can touch! 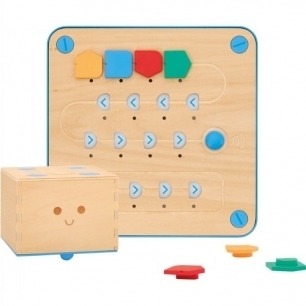 Cubetto features a friendly wooden robot that can be guided around the world with coding blocks and a tangible interface board. Just lay the world map out on the floor, place your robot at a starting point, and program his movements across the map by placing the coding blocks in the correct sequence on the interface board. Requires 6 AA batteries, not included. Communicates through blue tooth. Robot, blocks, and board are made from Linden Plywood.